Earthship Ironbank is now open as a Bed and Breakfast. Australia's first council approved Earthship is open - search for Earthship Ironbank on AirBnB. It has numerous sensors to monitor air temperature, humidity, solar radiation, and even the air speed in the earth tubes. The aim of this is to learn more about how Earthships work and to quantify the energy efficiency. See Earthship Ironbank website for details about workshops, tours, open days, BnB and project itself. 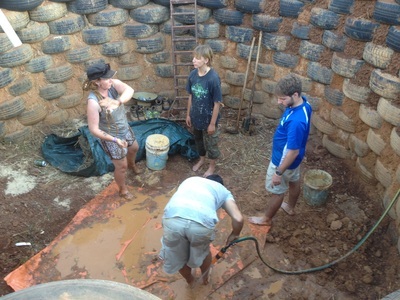 Earthship Ironbank under construction - January 2015 workshop. Earthship Eco Homes was founded by Martin Freney in 2014. The "mission statement" is simple: help get more people into Earthships. 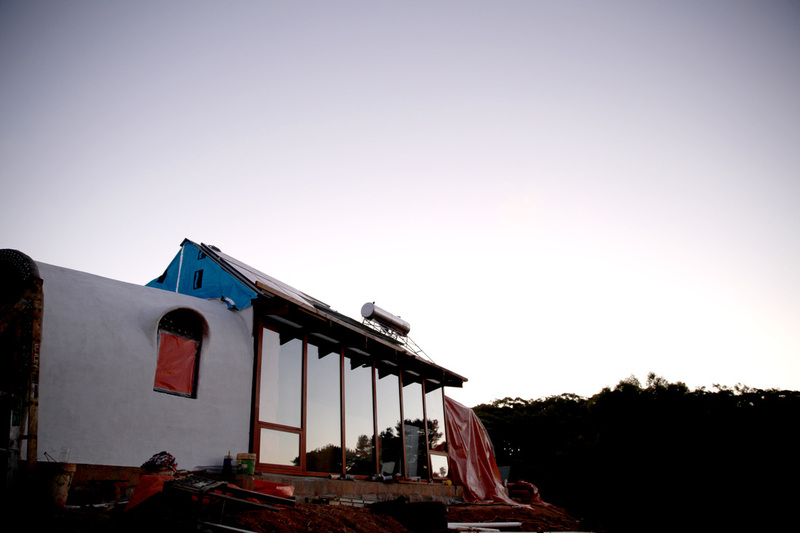 At this stage Earthship Eco Homes is involved with five projects around Australia. Some are briefly illustrated and described below to give an idea of the different things you can do with the Earthship design principles which can and should be adapted to suit each particular site. Issues such as bush fires, heat waves, termites, and national construction and energy efficiency codes demand that the Earthship be adapted to suit our Australian conditions. In the designs below, strawbale walls have been incorporated with tyre walls to introduce new design features such as small south facing windows for extra light and cross-ventilation, and to help connect to outdoor entertaining areas at the east or west ends of the building. Strawbale is a very energy efficient and ecological building material so its use in Earthships is logical. All the usual Earthship principles and design features are included with the addition of some new ideas. 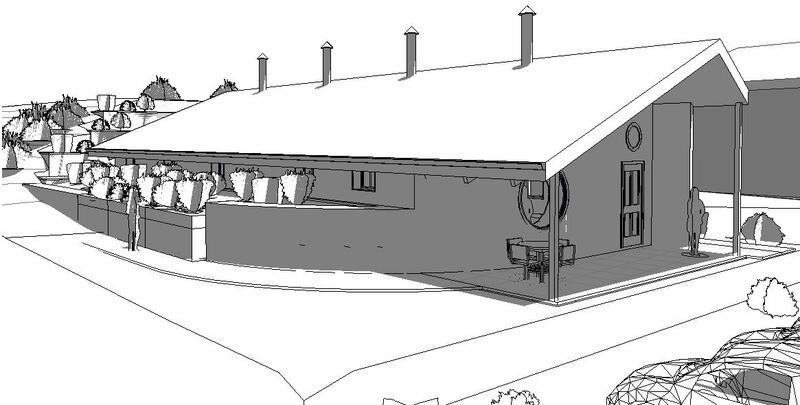 This earthship inspired design is a retrofit to an existing building with some constraints imposed by council regarding the need to comply with the existing footprint of the existing building. It has a tyre wall to the south with a course of strawbales on the tyre wall so that south facing windows can be included easily. The south facing windows allow extra light into the "ship" and also help with extra cross ventilation. A strawbale wall at the west end looking onto an outdoor eating area (pictured above) helps the thermal performance further. Inspired by Reynolds' "Global Model" Earthship, this Earthship design in Jurien Bay WA features many of the classic Earthship design features but also incorporates outdoor eating area at west end and a carport at east end. Plus small south facing windows in a single course of strawbales which should be great for capturing the summer seabreezes. This ship is just 1km from the coast. 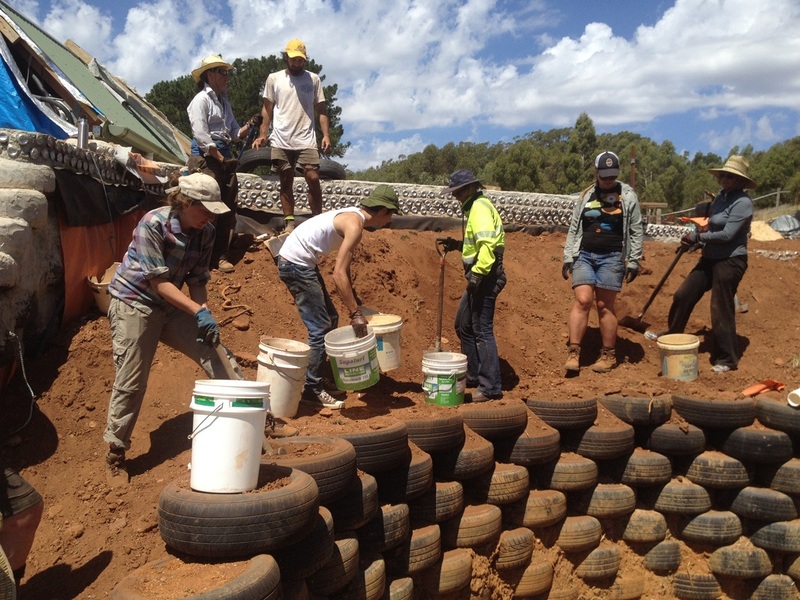 Earthship Fleurieu near Yankalilla in SA is inspired by Reynolds' "Global Model" Earthship. The chimneys are "solar chimneys" designed to heat up in summer and provide extra draw on the earthtube ventilation system. There are three modules, one of which is a carport (not pictured) with two main modules that will allow the project to be built in stages if necessary. Click on the Earthship Fleurieu heading above to go to the website. This earthship inspired design in the Narara Eco Village NSW is a two bedroom design for a small suburban block of land only 15m in the north south direction. Consequently the berm behind the tyre wall is smaller than usual and it is retained by another tyre wall (and concrete rainwater tanks) to help limit the berm's size. There is a curved strawbale wall at the east end with a big round window in it (visible above).